Every Christmas the Metropolitan Police service in London give gifts to children in hospitals, those in care or those who are victims of crime. Their dream is to give each child who may not receive a gift each Christmas a present. The initiative is based purely on the donation of Christmas presents from the public. Thanks to wonderfully generous donations, the Met Police were able to donate over 17,000 presents in 2016, and their aim in 2017 is to better that. Our vision at toucanBox is to unleash the creativity in every child, so we reached out to our community to see if they could help with contributions. Our community jointly contributed 148 Super toucanBoxes, each box featuring four crafts and a reading book. To match these generous donations, we donated a special edition Christmas Petite toucanBox alongside each box purchased. 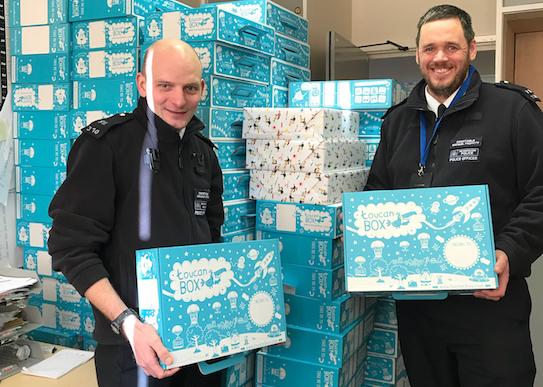 On Wednesday we had the pleasure of hand-delivering these boxes to the Met Police. 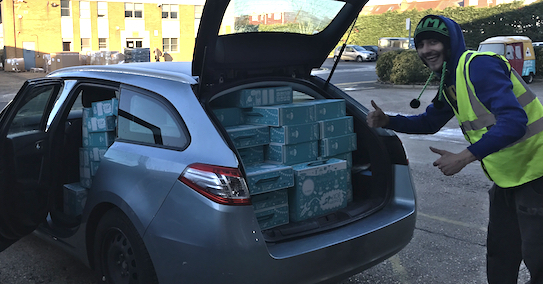 The first thing we realised was that it takes some expert packing to get 148 toucanBoxes into two modestly-sized family cars, without any passengers. Slawek and his team at the toucanBox factory explained that it’s moments like this that make them feel great about working for toucanBox. Knowing that these boxes are going to make such a big impact to children is a humbling thought. Getting a chance to reflect on that makes all the hard work worth it. We dropped the boxes off to Sergeant Kevin Fagan’s team at the Shepherd’s Bush station. They explained that the Met holds parties for looked-after children, where the children get to meet Santa and are given one of the presents donated by the public. At the time they were missing 150 presents, so the toucanBox donation made it possible for everyone to receive a present. “The look on a child’s face when they open a present is priceless,” one officer told us. We want to offer a huge thanks to everyone who contributed a toucanBox to the scheme. It’s an absolutely fantastic cause and we’re thrilled that we could take part. While the deadline for presents has officially ended, your local police station will still be accepting donations for deliveries to children in hospitals and victims of crime on Christmas Eve. Visit the Met Police Christmas Appeal website for the full details.